You know the year has almost come to an end when the review lists start. From what was most discussed on Facebook to YouTube’s most viral adverts, this week has seen the year in review lists come out in force. The Scottish Referendum was this year’s most discussed topic on Facebook in the UK. Other key subjects included the Ice Bucket Challenge and the FIFA World Cup. This week YouTube also revealed the most viewed ads globally on their platform in 2014. With the FIFA World Cup taking place this year, it comes as no surprise that football was rated highly in the top ten. 3. Budweiser Super Bowl XLVIII Commercial -- "Puppy Love"
Twitter also revealed their most discussed topics of 2014. Mirroring YouTube, the World Cup was clearly on everyone’s mind. 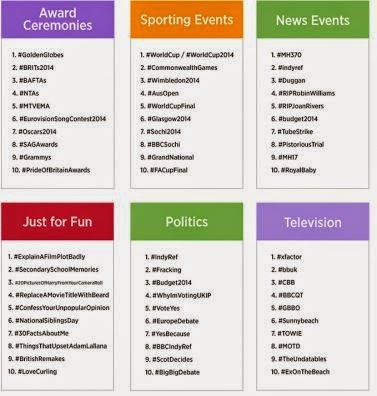 Of the top ten tweeted moments this year, six were focused on the World Cup. This week the social platform hit a milestone by overtaking Twitter with 300 million users, compared to Twitter’s 270 million. The growth highlights the hunger amongst consumers to share images and videos and will no doubt increase opportunities for brands, especially when the channel widens its advertising options in 2015. Great news for publishers! Facebook has released a series of new tools that will allow greater targeting with content. Among them, this includes Interest Targeting, which will only target a subset of followers relevant to that content. For example, a publisher can use Interest Targeting to post a story about a sports game that will only be shown to people that like the teams playing. YouTube has published a breakdown of the copyright restrictions imposed on video creators by their use of specific tracks, enabling creators to preview any restrictions before publication.